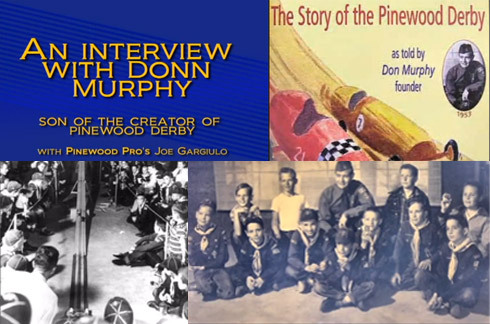 Watch this presentation and listen to Joe Gargiulo, the founder of Pinewood Pro, interview with Donn Murphy, the first pinewood derby racer! Donn's father is the inventor of pinewood derby car racing and he wrote the book PINEWOOD! The Story of the Pinewood Derby. Don Murphy's book includes full details, complete with pictures from the original race, original drawings, rules, etc. about how he invented pinewood derby cars and racing in 1953. His book is a great resource for any Cub Scout Pack, scout enthusiast, historian or Boy Scout collector. Donn Murphy, son of the inventor, talks about the history of pinewood derby in this exclusive Pinewood Pro interview. Donn talks about how his father, Don Murphy, invented the pinewood derby in 1953 citing excerpts from his father's book, PINEWOOD! 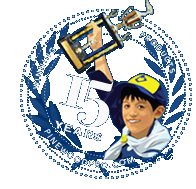 The Story of the Pinewood Derby, while Joe Gargiulo of Pinewood Pro talks about his book, Winning Pinewood Derby Secrets, that has helped people build winning pinewood derby cars for over 15 years. Video features many pictures from the very first derby race in 1953. For any scout or pinewood derby historians, I would strongly recommend reading a Joe Gargiulo's brief history of the pinewood derby and also picking up a copy of Don Murphy's book that gives full details, complete with pictures from the original race, original drawings, rules, etc. A great resource for any Cub Scout Pack or Boy Scout collector.